​Yes, arsenic. It occurs naturally in our environment in both organic (typically non-toxic) and inorganic forms. Inorganic arsenic is toxic and carcinogenic (cancer-causing). The biggest health risks from exposure to inorganic arsenic occur during pregnancy, infancy, and early childhood. In April 2016, the U.S. Food and Drug Administration (FDA) released a proposal to limit inorganic arsenic in infant rice cereal. The FDA's announcement was based on its assessment of a large body of scientific information. However, the FDA is not recommending specific limits on how much rice or rice products we should eat. Rather, the FDA is continuing to recommend that all consumers, including infants, children, and pregnant women, should eat a variety of foods, including a variety of grains. The American Academy of Pediatrics (AAP) supports the proposed action level and offers tips for parents on the issue. Breastfeed. The AAP recommends breastfeeding as the sole source of nutrition for your baby for about 6 months. 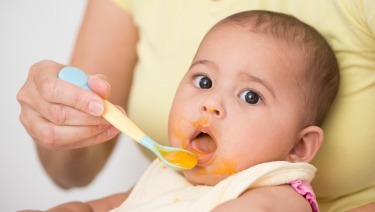 When you add solid foods to your baby's diet, continue breastfeeding until at least 12 months. You can continue to breastfeed after 12 months if you and your baby desire. Check with your child's doctor about vitamin D and iron supplements during the first year. Vary your baby's diet. Rice cereal fortified with iron is a good source of nutrients, but it shouldn't be the only source, and does not need to be the first source. Other options for parents to introduce as first foods besides rice cereal include oat, barley, and multigrain cereals. When introducing any new foods, the AAP recommends doing so slowly and watching for any reactions. Limit fruit juices. In 2012, similar questions were raised about arsenic in juice products. For years, the AAP has recommended limited intake of all sweet beverages, including juice. Infants can be encouraged to eat whole fruits that are mashed or pureed. Toddlers and young children can be encouraged to eat whole fruits instead of juice. Avoid brown rice syrup as a sweetener in processed foods for kids. The arsenic in rice is concentrated in rice syrup, which is sometimes used as a sweetener in toddler snacks​ or puffs. Do not use rice milk as a dairy substitute for cow's milk. In many cases, dairy-sensitive children can be given other dietary sources of calcium instead of a highly processed dairy substitute. Parents who have questions about their child's nutrition are encouraged to speak with their pediatrician.